America’s Land of Enchantment, New Mexico is bisected north to south by the Rio Grande. The Great Plains cover much of the eastern third of the state while mountains and basin and range country lie west of the Rio Grande Corridor. Other major rivers include the Canadian River, the Gila River, the Pecos River, and the San Juan River. 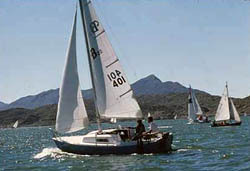 Many artificial lakes are in New Mexico, the four largest being Elephant Butte Lake, Conchas Lake, Navajo Lake, and Caballo Lake. Less than 1% of the state (about 230 square miles) is covered by water. What is New Mexico’s maritime heritage? People have occupied the Rio Grande Corridor and other parts of New Mexico for over 11,000 years. The earliest people were Paleo-Indian big-game hunters while later people of the Archaic Period had a more diverse hunting and gathering lifestyle. About 2,000 years ago, the Ancestral Puebloan and the Mogollon cultures adopted a more sedentary lifestyle of living in villages, farming, and trading. By the 1500s when Spanish explorers entered the area, the ancestors of the Navajo, Apache, Puebloan, and Ute groups were in New Mexico. Juan de Onate founded the first Spanish colony in New Mexico close to San Juan Pueblo near the confluence of the Rio Chama and the Rio Grande in 1598. It and later colonies like Santa Fe were connected to Mexico City via El Camino Real de Tierra Adentro, a trail that followed more ancient footpaths along the Rio Grande. The route was used by settlers, missionaries, armies, and traders for almost 300 years until it fell into disuse after the railroad reached New Mexico in the 1880s. New Mexico’s rivers have always been challenging for boating. This is because some of them are filled with stretches of whitewater while others are ephemeral or intermittent and dry much of the year. Today, sections of the rivers are popular for canoeing, kayaking, rafting, tubing, camping, and fishing; and the lakes are popular for recreational boating and fishing. 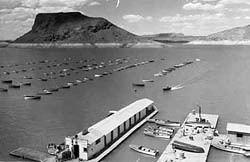 Many of New Mexico’s artificial lakes contain the ruins of prehistoric and historic sites and towns that became inundated when the reservoirs were filled with water. This includes 5,000 year old Archaic Period sites, 14th century pueblos, 17th century Navajo sites, 19th century Hispanic ranches, and 20th century homesteads. Some reservoirs contain the remnants of camps associated with construction of the dams. Many sites in reservoir pools are permanently submerged while others are seasonally inundated. Although the navigability of New Mexico’s rivers is limited, the rivers have the potential to contain a range of underwater sites from prehistoric to historic times. The possibilities include wrecked or sunken canoes, rafts, and other vessels, and submerged remains related to bridges and ferry landings. Who takes care of New Mexico's underwater archeological sites? The New Mexico Department of Cultural Affairs has overall responsibility for the state’s archeological sites. The Department accomplishes much of this work through its Office of Archaeological Studies, the Historic Preservation Division, and the Museum of Indian Arts and Culture. The Department cooperates with the New Mexico State Land Office, the New Mexico Energy, Minerals and Natural Resources Department, and other state agencies that own or manage state lands. The Office of Archaeological Studies conducts research to identify, interpret and share information about New Mexico’s archeological sites. Much of the work is done on behalf of state agencies and private entities whose development projects may impact sites. The Historic Preservation Division identifies, documents, and nominates archeological sites to the State Register of Cultural Properties and the National Register of Historic Places; coordinates archeological review and compliance activities; promotes archeological public education and outreach; and protects and preserves significant sites. The Division maintains information about the state’s sites in an online Archaeological Records Management Section and, with the State Archaeologist, reviews applications for state archeological permits. The Museum of Indian Arts and Culture is the state’s repository for archeological materials from state lands. The Museum accepts donations of artifacts from private lands in New Mexico, and cares for materials from some Federal and tribal lands in New Mexico as long-term loans. The Federal Government takes care of many archeological sites in New Mexico because it holds about 42% of the land in the state. This includes public and Indian land managed by the Bureau of Indian Affairs and the respective Indian tribes, the Bureau of Land Management, the Forest Service, the National Park Service, the Fish and Wildlife Service, and the Department of Defense. You need a permit from the New Mexico Cultural Properties Review Committee to conduct archeological investigations on lands owned, controlled or operated by the state, or to conduct archeological investigations using mechanical earth-moving equipment on private land. Permits are issued to qualified applicants with the concurrence of the State Archaeologist, the State Historic Preservation Officer, and the public or private landowner. You need a Permit for Archeological Investigations from the appropriate federal agency to conduct archeological surveys and excavations on federally owned or controlled land. What laws concern underwater archeology in New Mexico? New Mexico’s laws about its archeological sites are in Chapter 18 (Libraries, Museums and Cultural Properties) in the New Mexico Statutes. This includes the Cultural Properties Act in Article 6, the Cultural Properties Protection Act in Article 6A, and the Prehistoric and Historic Sites Preservation Act in Article 8. Related regulations are in Chapter 10 (Cultural Properties and Historic Preservation) of Title 4 (Cultural Resources) in the New Mexico Administrative Code.